The goal is the generation of antibodies specifically reacting with and neutralising certain toxic forms of β-amyloid (i.e. pyroglutamate-modified Aβ) which accumulates in the brains of AD patients. In addition, new diagnostic methods are being developed allowing the evaluation of the treatment effect. Exposure of the body’s immune system to so called antigens in an immunologically relevant manner (i.e., together with adjuvants) results in the generation of a specific immune-response. Its specificity is mediated by T-lymphocytes and antibodies. The technology is based on the use of antigens functionally mimicking the original. This can be accomplished in a way that precludes the activation of autoreactive antibodies. Obviously, this is key to the safety of AFFITOPE® vaccines and represents one of their integral safety measures. WHAT WAS ACHIEVED UP TO NOW? 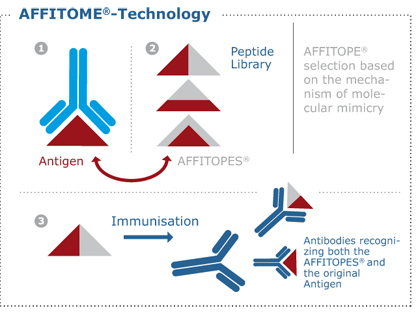 Using appropriate selection antibodies, a series of AFFITOPES®, that are functionally mimicking toxic β-amyloid species, has been identified. Their administration to APP transgenic mice, models of the human Alzheimer’s disease, was not only found to reduce their amyloid plaques and disease-specific brain lesions but also to ameliorate their cognitive function. As a next step, the vaccine candidate’s safety and tolerability in humans is being tested within a phase I clinical trial. The respective preparations have been concluded successfully; as of December 2010 the first AD patients have been vaccinated with AD03. Presumably, the results of the Phase I clinical trial will be available at the end of 2011. Provided that these are going to confirm the safety and tolerability of AD03 in humans, the determination of its clinical activity within clinical Phase II and –III studies can be started. These will need to recruit several hundred patients, their completion will take up to five years.